Starting naturally is the best way to begin the process of alleviating menopause symptoms. Making small changes to your lifestyle can help you pinpoint what may be triggering your symptoms and what helps alleviate your symptoms. This well help you make well-informed choices that are right for you. Our diets can help exasperate or soothe many of the physiological problems we face, and this includes menopausal symptoms. Drinking caffeine and alcohol, smoking, and eating spicy foods can trigger symptoms including hot flashes, night sweats, and mood swings. However, eating a balanced diet full of fruits, vegetables, whole grains, fiber, and protein, can help to relieve symptoms of menopause. Decreasing the amount of processed foods you eat can also help improve your overall well-being. Experts advise most people to have around eight cups of water each day. Working this into your daily routine by having a bottle of water handy during the day and drinking herbal tea with breakfast can help you keep your water consumption healthy. Staying hydrated can regulate body temperature and therefore may reduce the chances of hot flashes, and staying hydrated can also decreases headaches. When you change up your routine, for example over the weekend or when you go on vacation, it is easy to forget to drink water, so try to make sure you are staying healthy and hydrated at those times too. The importance of sleep cannot be overestimated and is needed for almost every aspect of a person's mental and physical well-being. Most people need to get around eight hours of sleep each night, but some people need more and some people need less. You know your body the best, and should be able to gauge how much sleep you need. Getting a proper amount of sleep is important for healthy brain functioning. You need enough sleep in order to have a healthy immune system, a healthy cardiovascular system, and in order for your brain to tell your body that it is full. Regular exercise helps keep hormones balanced and is necessary for overall health. Weight training is good for developing strong bones, controlling your weight, managing some chronic conditions, and improving focus. Running, swimming or doing another cardio activity a few times a week, is also good for overall health, especially your heart. Workouts like yoga and pilates are used to relieve stress, anxiety, and tension, and to improve mood and flexibility. These are four of the best steps to take when looking to minimize the symptoms of menopause and lead a healthy life overall. However, these lifestyle changes are often not enough for everyone. Many women are able to relieve their symptoms by using herbal supplements and/or prescription medicine alongside a healthy lifestyle. 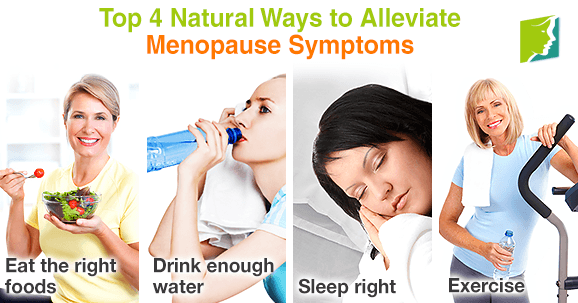 Click on the following link for more information about treating menopause symptoms. The first stage of the menopause transition is known as perimenopause, and is when symptoms first appear. Learn more about its causes and treatments here.